but as soon as they arrive at their new home in Lost Spring, Wyoming, the town turns out to protest. They don't want a new hotel if the resident mustang population will be displaced or hurt as part of the deal. Then Brie meets Logan, a gorgeous local who has a special connection to the mustangs, and she is immediately drawn to him . . . and the horses. However, with Logan's father leading the protests and Brie's father refusing to budge, it's clear that their parents are heading towards an all-out war. Can Brie and Logan find a way to save the mustangs and be together? Or is their love doomed from the start? My Thoughts: I really wanted to love this one. It sounded amazing but I only ended up just liking it. We are introduced to Brie whose parents move her around a lot due to her dad’s business. Brie is generally alright with this. She doesn’t make a lot of friends and she’s used to living all over the world. When Brie’s dad’s new job lands the family in Lost Springs, Wyoming things get tough! There are wild horses running around on the land her dad is working on and this creates a lot of problems. She also meets a boy named Logan who her dad would never approve of her dating. I really liked the romance in this one even though it was fast too. At times I felt like it was a bit rushed. I loved the horse angle. I loved when Brie and Logan went camping and found the horse in labor! That was definitely interesting! I liked Wild Hearts but I didn’t love it like I had hoped! I liked the characters and the plot but I had trouble getting through it and and I just didn’t connect to the characters or the plot like I wanted. 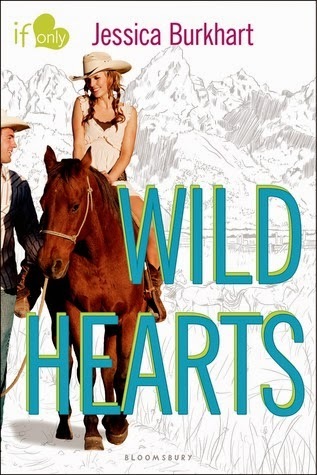 Overall: Wild Hearts wasn’t my favorite If Only book yet but I will keep reading them as they come out! I always love the idea of the plots! Very romantic and interesting. Cover: Love it! I really like cover! Its cute. And I love the horse on it! Neat!